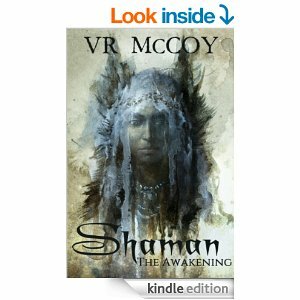 “Shaman, The Awakening” by VR Mc Coy is an inspired blend of crime investigation with Native Indian Shamanism. I was stunned by the vast knowledge on Native Indian culture that has been skillfully woven into what is a modern day detective story about abducted women. Our hero Chris has a unique ability around premonitions and dreams, which makes him a prefect tool for the FBI. Many a detective work with their intuition, so the Shaman powers fit in naturally into this field. Chris is inexperienced in many ways and has to come into his own, at the same time he has been institutionalised because of his ‘gift’, so he really is already a great and interesting character before the crime story begins. I have been an eager fan of several supernatural TV detective series but this book/ series is different from many such one-trick-ponies. The tribal roots and culture, the character depth and the well laid out plot – this is a very profound and captivating book. VR McCoy is a native of Washington, D.C., who currently resides in Atlanta, Georgia. He attended Archbishop Carroll Highschool (H.S. of the famed Alex Cross/ James Patterson novels) and Howard University in Washington, D.C. Writing genres are Action & Adventure, Crime & Mystery, Espionage, Thrillers and Fantasy. Inspired by James Patterson, Walter Mosely, Steven King and Tom Clancy. I’ve always had an inner voice that has encouraged me to write; poetry, songs and short stories. I’ve dreamed about writing novels since I was a child and when television became too unbearable; I turned it off and picked up my pen to satisfy my needs. My passion and love for the written word. An excellent review site and a place to go to discover new reads.